Yeastar, a leading manufacturer of VoIP PBX systems and VoIP Gateways, and Snom Technology GmbH, a leading German manufacturer of SIP-based telephones, today jointly announced the enhanced interoperability partnership, integrating the best of breed PBX and IP phone technologies. 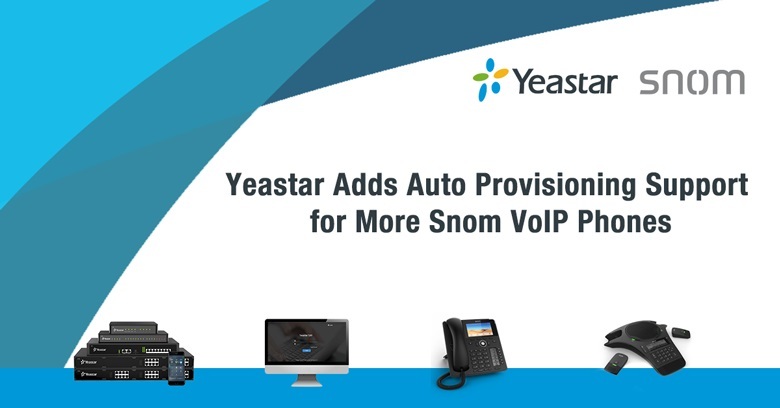 Yeastar auto provisioning support of Snom devices dates back to its first-generation MyPBX. Investing resources and energies, Yeastar and Snom spared no efforts to guarantee interoperability. Now, the full range of Snom IP phones, including the latest Snom D785 advanced desk phone and C520 WiMi conference phone with DECT microphones, have successfully passed all interoperability tests with the Yeastar S-Series VoIP PBX and can be automatically provisioned easily and quickly. You can see Snom and Yeastar’s products and meet the teams in person at this year’s CeBIT in Hanover, Germany between 11-15 June 2018 on Stand C84(Snom), and Stand D134(Yeastar), Hall 13.